The Kasbah of Algiers was founded on the ruins of old Icosium, a Phoenician commercial outpost called which later developed into a small Roman town. It is a small city which, built on a hill, goes down towards the sea, divided in two: the High city and the Low city. One finds there masonries and mosques of the 17th century; Ketchaoua mosque (built in 1794 by the Dey Baba Hassan) flanked by two minarets, mosque el Djedid (built in 1660, at the time of Turkish regency) with its large finished ovoid cupola points some and its four coupolettes, mosque El Kébir, mosque Ali Betchnin, Dar Aziza, palate of Jénina. 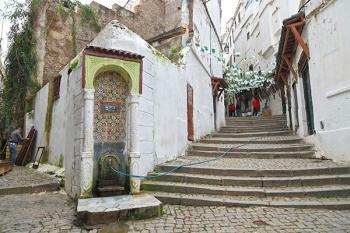 In the Kasbah, there are also labyrinths of lanes and houses that are very picturesque. Site visited January 2014. I’ve always been intrigued by the Kasbah of Algiers so I looked forward to visit it. I wanted to see if it lives up to its mysterious and sinister image. The Kasbah is obviously very easy to visit when you are in Algiers. But is it that simple? Every travel guide I had read warned that the Kasbah is very dangerous place and can’t be visited on one’s own without a local guide or other protection. In Algiers I asked the hotel receptionist what would be the best and safe way to visit the Kasbah. He said ”just go there - what is the problem”. He didn't understand why I asked about the safety. Next I tried to find a tourist info in order to get a guide. After a long searching someone on the street showed me the way to some kind of a tourist info yet it didn't look like one. I went to the desk and asked for a guide. Woman at the desk introduced me some ordinary looking old man with a shopping bag. She asked the man to walk with me in the Kasbah. This nice old man said that he is born and raised in the Kasbah. I walked with him around the Kasbah about two hours. He showed me the house where he has born and we went to greet his brother and friends. The man also invited me to a cafe for a cup of tea where we joined a group of other old men. I had a really nice time chatting with these men while sipping my tea. I asked them about the dangerous reputation of the Kasbah. They totally disagreed and said that crime and violence is against all their principles. They were really curious about me and wanted to know what made me come to their country. At least these friendly old men were nothing but welcoming towards visitors. In the end of our walk I thanked the man and offered him some money. He refused because, as he told, he is not a guide. Later that day, after having visited Notre Dame d'Afrique, I walked back to top of the hill to the High Kasbah because I wanted to explore it on my own. From the street I popped in to some alleys. Narrow and steep alleys with red colored buildings are different than the wider alleyways and white buildings of the Lower Kasbah. I was very careful although it was very quiet and I didn't see almost any people at all. After a short walk and photographing I headed back to seafront via the southern end of the Kasbah. To sum up, particularly the Lower Kasbah is quite safe to walk around on your own. It was very crowded and looked like any other medina or shopping area. It is also spacious and there are lots of palaces, shops and cafes. Maybe some parts are not that safe but I didn't have that feeling. The quiet and labyrinthine alleys of the residential area of the High Kasbah could be hazardous for westerners and tourists. I’d recommend to get a guide at least for that area. As mentioned in the earlier reviews, the Kasbah is in a very poor condition. One can see collapsed buildings and piles of trash everywhere. I hope they preserve some buildings and areas before it is too late. At least the citadel with Palais du Dey needs restoration and opening to the public. Preservation of the whole area would need emptying it which is quite unrealistic. It seems that the Kasbah is beyond the control of police and government which makes preservation projects almost impossible. It is possible that we lose this site before our eyes. I guess some areas could be saved but it would need immediate actions. The Kasbah of Algiers is different than other similar sites like medinas in Morocco and Tunisia. As Algeria lacks tourism the Kasbah is really authentic and lively place. It is raw, threatening and still ordinary. Visiting it is a thrilling experience you’ll remember, for better or for worse. My husband grew up in the Casbah and like generations before them, his family still live there so, I have visited many,many times. As others have said, the area is in great disrepair. It is saddening to see a place so rich with history literally crumbling to the ground. However, despite the dilapidation there is something quite special about it: the narrow, winding alleys, the beautiful tiling, tiny shops that are wedged in everywhere, donkeys that collect rubbish, rooftops to sip afternoon coffee, the people....so many charming things that evoke thoughts of times long gone. Things move slowly but,I hope that eventually it will be restored to it's former glory. 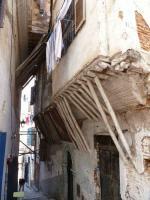 I can’t think of any cultural WHS I have visited which has been in a worse condition than the Algiers Kasbah. Yet UNESCO seems remarkably indulgent towards it. Yes, the state of the site has been discussed on many occasions since its inscription in 1992 and “decisions” are reached calling upon Algeria to take some action but, on the ground there is little evidence of improvements and plenty of further deterioration! A strange aspect about this is that at the 2004/5/7/9 and 11 WHCs the site was discussed under the heading “Desired state of conservation for the removal of the property from the List of World Heritage in Danger” – yet I can find no evidence that it has ever been on that list! Large areas of housing have collapsed and, in places, complete avalanches down the hill on which the Kasbah is built, have created giant scars. An earthquake in 2003 was only a partial cause of this damage. A significant percentage of the other buildings are held up by wooden scaffolding – often stressed against the neighbouring building across the narrow passage thus creating an even more claustrophobic atmosphere than is normal in this labyrinth. Wherever a house has collapsed the area has become a rubbish dump. The authority’s unsuccessful answer to this has been to create “walls” of oil drums to keep people out! The construction of a metro extension under the area has added to the problems. One station is to be directly under “Martyrs Square” – a flat area which once contained parts of the Kasbah before the French colonialists flattened it. It was also part of Roman Icosium and, before that of Punic settlements. The entire square is currently (Dec 2012) surrounded by high solid fencing within which is a building site. Apparently the station has been redesigned to place it below the archaeological levels but, at the 2011 WHC, UNESCO “requests the State Party to attempt to further reduce this impact and to submit to the World Heritage Centre before starting work”. There is no evidence that this has been done and work is well advanced!!! In preparation for the visit, during it and subsequently, I have tried hard to discover the boundaries of the site. In 2011, for the nth time Algeria was asked to provide such a map, this time by Dec 1 – but nothing about the site (neither the map, nor the state of conservation) was discussed in 2012 – too busy discussing Liverpool perhaps! However we did find 3 signs announcing that we were within the “secteur sauvegardé de la casbah d’Alger” – all 3 were graffiti-covered and peeling – but, on one, there was, just visible, the UNESCO logo! They also contained a map with various coloured lines – one of which was described as “Limite du secteur sauvegardé” and another as “Limite du périmeter classé”. Which of these, if either, might be the UNESCO inscribed area I am not clear but both included an area right down to the coast – which covered the French built frontage now known as “Boulevard Che Guevara” AND the Jetée Kheir-Eddine with the Admiralty. This latter is significant since this was originally an island (Algiers takes its name from al-Jazā’ir = “The Islands” from the range of rocks in the Bay). This island was occupied by Spain in the 16th Century and was known as “Penon”. Then, after capture by the Ottomans, it was joined to the mainland and formed Algiers’s first man-made breakwater. As the Metro build has shown, this whole area will contain hidden archaeological remains – but, above ground, doesn’t seem to contribute to the OUV as currently described – though the faded French colonial glory is well worth taking in! Algiers really could be a beautiful Mediterranean City if only it were looked after. Algeria’s post independence history has been pretty torrid and inimical to such preservation matters, but, although there is a lot of poverty, the country has massive oil and gas assets and is currently finding $1.3 billion to build the World’s 3rd largest mosque. The history of attempts to preserve the site is lengthy. In 1979 Algeria first sought to nominate the Dey’s Palace but withdrew it and later submitted an extended nomination for the “entire” Kasbah. The 1979 nomination notes “This property, now in a dilapidated state…..” and “some emergency weather proofing work has been done…”. No wonder the nomination ( http://unesdoc.unesco.org/images/0003/000378/037826eb.pdf ) was withdrawn! Despite plans to open it as a museum this palace is still closed for renovation 34 years later! The inscription of the Kasbah in 1992 was also “strange”. The previous year ICOMOS was unhappy about preservation and it was “referred”. Yet the minutes record something more substantive - “The Committee decided to initiate the procedure for the inscription of this site on the World Heritage List and, to this effect, requested that a conservation plan taking into account the proposals made by the archaeologists and historians responsible for the preservation of the Casbah of Algiers be prepared.” The following year the WHC noted “with satisfaction” that “a general safeguard plan for the Kasbah had been drawn up and approved.” So that was ok then and it got inscribed!! In fact no (possibly???) meaningful plan got accepted by the government until May 2012!! This plan had first been developed in 2003 but it took the intervening 9 years for it to reach Governmental acceptance. It is apparently to be carried out with Catalan assistance. The original plan can be found here and contains lots of information about the Kasbah - http://www.qualicities.org/~polesud//fichiers/ALGER-casbah.pdf Whether the money, management capability and support of the local people will allow it to be brought to fruition before the whole site collapses is another matter. So, is a visit in today’s conditions worthwhile? Among all the decay, detritus and destruction there are still things to see. It is necessary to look up – at the windows, the overhanging floors and the skylines and also “to look “in” at small cul de sacs, through doors and archways and into hallways even though, very often, you will be rewarded by piles of rubbish, squealing cats and unpleasant smells!! 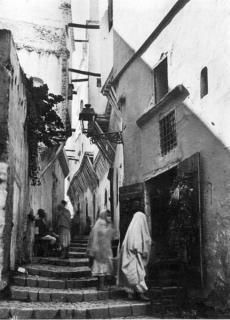 And there are the people – though most of the men have forgone ethnic clothing for leather jackets etc you will still see the scurrying women with covered heads and lace veils giving the alleyways a timeless look as in the B+W photo featured above by Els. Down near the port there are the Djemaa el-Kebir and Djemaa el-Jedid mosques – the former is 16th century Ottoman, whilst the latter dates back to the 11th century. Although these are supposedly not open to non-Muslims we were invited into the latter at a non prayer time - but it was very plain and the exterior views are the main aspect to go for. Further in is the mosque-become-cathedral (by the French on 1930) become mosque again of Ketchaoua. It is surrounded by fencing - possibly indicating some renovation or else to protect people from falling masonry! Beyond these you just have to dive into the maze of alleyways, tunnels and stairs which constitute the main Kasbah. It is perhaps worth mentioning the issue of security at this point – the Kasbah has a poor reputation. In a country where police swarm everywhere we saw NONE inside the area and were told that it is a “no go” area except for properly mounted operations. An alleyway is very easy to block off at either end. We walked around by ourselves for an afternoon at all levels without incident but our subsequent “guided walk” would not take us to the upper Kasbah. The general “street awareness” rules valid everywhere apply – in particular, try not to go where there aren’t women and children. There are some more notable buildings behind the walls - unfortunately there are relatively few opportunities to get inside them. We were particularly disappointed to miss the Museums of Islamic Calligraphy and of Popular Arts and Traditions both of which are situated in, apparently well restored, Ottoman town houses but were closed when we were there on New Year’s Day. We did visit the Mausoleum of Sidi Abdul-Rahman, the patron Saint of Algiers – such “saintly” mausolea are a north African Muslim tradition but are, we were told, facing opposition from more fundamental Sunni tendencies who adopt the purist belief that there should be no intermediaries between man and Allah and that any hint of worshipping a “saint” must be avoided. We also passed a few well tiled Hammams which could have been interesting to enter! So, our experience is that the Algiers Kasbah offers lots of interest regarding both historic and modern Algeria -if you make it there you aren’t going to miss it anyway, but don’t look for architectural excellence or beauty or an ethnic time warp - this place is “raw”! I miss Algeria!! I lived in Algeria 1963-1967, as a high school student. I had the wonderful opportunity to visit the Casbah. It has left an indelible impression on me. The timeless experience serves to open my heart to this day. What, 48 years later and I am a silver surfer reconnecting!! Thank you for having this site. Details of protection required. Also ICOMOS to carry out a comparative study of "Medinas"
Piracy: "A Turk corsair Khair-al-din .. founded his capital in Algiers in 1516". He is better known in Europe as 'Barbarossa' and under him and his successors Algiers became one of the main ports of the 'Barbary Pirates' for several centuries. As part of a combined European attempt to wipe out the piracy the city was bombarded on 27 Aug 1816 by an Anglo-Dutch fleet and c1000 Christian slaves held there were freed. Mosques converted from churches , cathedrals or synagogues: "Ketchaoua Mosque" was re-created in 1962 from "Cathedral of St Philippe" which itself had been created from the Ketchaoua mosque in 1845. Sufism: The Tomb of Sidi Abdul Rahman Athaalibi - "Sufi brotherhoods have retreated considerably, but remain in some areas. Saint cults are widely disapproved of as un-Islamic, but continue, as a visit to the shrine of Sidi Abderrahmane in Algiers quickly demonstrates" (Wiki). Location for a classic movie: La Battaglia di Algeri (Dir - G Pontecorvo, 1966, B+W). Won Venice "Leone d'Oro" and "occupies the 120th place on Empire Magazine's list of the 500 greatest movies of all time" (Wiki). Shot on location in the Algiers Kasbah, it tells the story of the organisation of the FLN guerilla movement there between 1954-57 during the Algerian war against France. Once banned in France and elsewhere it has been accused of inspiring political violence and spreading guerilla tactics around the World.